In December 2016 Cardinal John Dew convoked a Synod for the Archdiocese of Wellington for the weekend of 15‒17 September this year. A bishop may convoke a synod in his diocese to provide space for prayer, reflection and dialogue about the future directions that diocesan’s people might take together with their bishop. Pope Francis has described a synod as “a path of solidarity, a journey together… a synodal Church is a Church which listens, which realises that listening ‘is more than simply hearing’. It is a mutual listening in which everyone has something to learn”. At the time of the convocation, Cardinal John asked people to begin a period of prayer for the Synod, that it might be ‘a time of grace for the Archdiocese’. The Synod Prayer has been said at Mass in the Archdiocese since the beginning of this year and people have been asked to pray individually for the Synod. Between March and May parishes and schools selected their participants to attend the Synod. They are known as ‘members of the Synod’. The number of Synod members from each parish is based on the size of the parish. Also attending will be priests in active ministry in the Archdiocese, and people with particular roles in the Archdiocese, for example members of advisory bodies and leaders of Vicariates. The Rector of the National Seminary will also attend. In May and June everyone in the Archdiocese was invited to participate in determining the Synod agenda. Ten topics for discernment, included in the participation document, covered: leadership; going to the peripheries of society; our bicultural relationship; being one Body of Christ when we are many ethnicities; people on the peripheries of the Church; refugees and migrants; caring for creation; engaging with fellow Christians; accompanying the young; and supporting marriage and families. The input from this participation phase has now been analysed and published in the Synod Member’s Booklet. As a result of the input, two new topics have been introduced – one on spirituality and one relating to the use of our assets. All members of the Synod will have received a copy of the booklet. It is available on www.wn.catholic.org.nz (Synod column on the homepage). 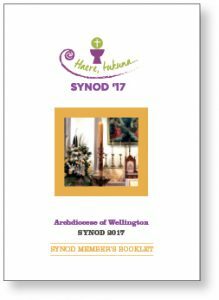 The Synod Member’s Booklet is the working document for the Synod weekend in September. The Synod members’ task is to develop recommendations to Cardinal John about future directions and priorities for the Archdiocese based on the booklet material. After the Synod, Cardinal John will review the recommendations and will issue a decree about the future directions and priorities for the Archdiocese. The Archbishop is the sole decision-maker about the Synod’s outcomes, but he makes those decisions knowing there has been wide participation in the Archdiocese and prayerful discernment by the Synod members. Once the decree has been issued it is then the responsibility of parishes, schools and organisations in the Archdiocese to implement the Synod outcomes in their own area. Therefore, during 2018 pastoral planning based on the Synod outcomes will be a major focus, particularly for parishes.